Born in Barcelona, Maria Luisa Cantos started piano studies at the age of three, and gave her first public performance when she was five. She studied simultaneously the piano and the organ at the Barcelona Conservatory and qualified as a piano teacher when she was just 16, the age at which she won its competitive “Extraordinary Prize” examination. A frequent attendee at master-classes given by grand maestros, she was also awarded other prizes and distinctions, which allowed her to broaden her musical training in Paris and Vienna. These studies provided the foundations for a very successful piano career, during which she has been a soloist with many orchestras and has given recitals in Europe’s most important musical centres. Musical tours took her to different North and South American countries, including the United States, Chile and Venezuela, where she was awarded a prize. 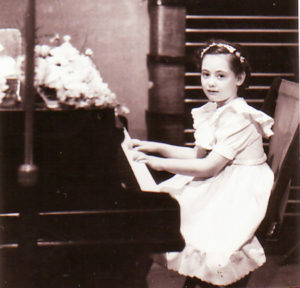 A recital she gave at the Carnegie Hall in New-York prompted enthusiastic praise from critics for her „refined and brilliant technique“, „power and force of interpretation“ and „exceptional musical expression“. In addition to her piano career, Maria Luisa Cantos has devoted much time to researching Spanish musical history. A consequence of these studies is the now-famous International Course for Interpretation of Spanish Music, which has been held annually in Baden, Switzerland since 1979, and which has become a benchmark in the musical world for this type of forum. In 1990, she created the Hispano-Swiss Musical Foundation whose main goal is to promote and spread Spanish music in Switzerland, and in Central Europe, and is its head and artistic director. In recognition of her cultural efforts, she was awarded the much praised „Lazo de Dama“ of the order of Spain’s „Isabel la Católica“. 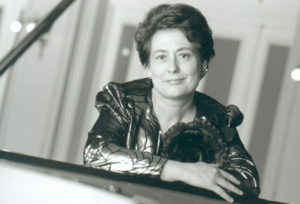 In 1999, she was the soloist entrusted with performing the world premier of a piano concert composed by Francisco Martín-Jaime (winner of the Queen Sofia International Prize for Composition), with the Spanish Radio-Television Symphony Orchestra in Madrid, and in the presence of Her Majesty The Queen of Spain. 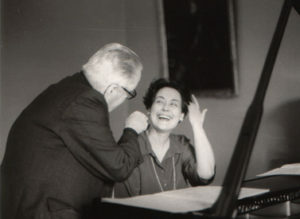 Since then she has collaborated closely with the composer, including a solo performance in Paris -“Tributes to Joaquín Turina”, in Vienna with “A Tribute to Joaquín Rodrigo” and at the Botin Foundation in Santander. Among her many recitals are performances at the Schönberg Centre in Vienna, with a programme entitled „Schönberg and Barcelona“, which showcased composers with musical links to the Viennese and the Catalonian Schools. She also performed at the International Festival of Toulouse with „Piano Jacobins“ followed by solo performances with different orchestras, of works by Rachmaninoff and Katchaturian, amongst others. More recently, in celebration of the 40 years of activity of the Hispano-Swiss Musical Foundation, her performance as a soloist with the Hungarian Virtuosi Chamber Orchestra was followed by by a successful tour of Switzerland, Slovenia and Hungary, culminating at the prestigious Academia F. Liszt in Budapest. Her broad repertoire, choice of programmes and her great diversity, including her interpretations of Brahms, Schumann and the impressionists, demonstrate her musical depth and versatility. Her repertoire includes the complete works of important Spanish composers such as de Falla, Granados, Mompou and Nin-Culmell, some of which have been recorded, as well as several works by French composers. She is one of the more important musical performers in Switzerland, and is well-known elsewhere as she is frequently invited to participate in international festivals.